Surface Style Register: Surface Style Registers are also called “drop-in” vents, because they literally drop into the duct hole in the floor. 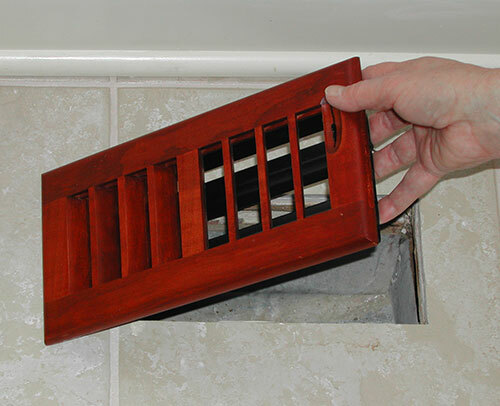 You simply remove the old vent and replace with your new wooden vent. Flush Mount Registers: Flush Mount Registers may be installed into your flooring when you are initially laying the wood or laminate floor, or they may be retrofitted into an existing floor. Click Here to download step by step instructions for installing flush mount wood registers. Please call us or request more information on instructions for installing flush style registers into your floor. Baseboard and Slab Style Registers: Baseboard and Slab style registers sit on the floor up against the wall. These may be secured to the wall in a variety of methods (screws, nails, Velcro tape), dependent upon the need and/or frequency to access the duct work behind or below the vent. Wall & Ceiling and ComforToe™ toe-kick registers are mounted into a wall, ceiling or inserted into a cabinet, stair riser or other framed structure. These may be secured to the wall, ceiling or structure in a variety of methods (screws, nails, Velcro tape), dependent upon the need and/or frequency to access the duct work behind the vent. A Sales Engineer is available to discuss any installation questions you may have. Our hours of operation are Monday through Friday, 8 am to 4:30 pm Central Standard Time.